Should you stress about naming characters? I’ve begun to think that I put a lot more emphasis on a character’s name than he or she really deserves. Sometimes, I spend hours just browsing behindthename.com because I’m convinced that if I look just a little bit longer I’ll find the one name that will fit perfectly. As I tackle my novel, this has come to the forefront. Most of my characters in the story have boring English names like Benjamin and Alexander. The type of names that won’t stand out to the reader, but they mean the world to me. After all, I spent hours looking for just the right meaning to fit the character I’m writing. Benjamin means “son of my right hand” and Alexander means “defender of men.” Ask about any one of my characters, and more than likely I could tell you exactly what his or her name means. What happened, though, was I stumbled into a dilemma. One of my characters has a Greek name. While that in itself isn’t something to worry about, I realized he is supposed to stand out because of where he is from, but everyone else in that area has a name of Hebrew origin. Names have an impact on the characters, but not in the way I thought. The fact that one of my character’s names means “free” has no impact on her character. However, knowing her mother named her for her dead grandmother just might. In the same way, giving a character a Greek name in the area where he lives is something that could cause him to stand out. What is the story behind his name? What impact does it have on his character? So here’s my advice as a writer who has had this epiphany. Instead of tirelessly researching the etymology of your character’s name, try just giving him or her a name. Any name will do. 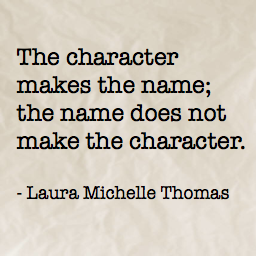 Then decide why that character is named what he or she is. Did his or her parents just like that name? Is there a special significance to it? And if there is something significant, find a way to incorporate that into the story, or into the way the others characters perceive him or her. Don’t stress about naming characters. Just give them a name, any name. Ebony Taylor is a 19 year old writer from the USA. Ebony has been writing more or less seriously since age six. She dreams of writing a high fantasy series, but she will just as easily settle for publishing a short story or an article. Read Ebony’s blog. Ebony has done it again. Character naming. Wow. I agree totally. Can’t wait for her novel. I encourage everyone to stay with her Blog. Also she was nominated for the Liebster Award.